Seattle-based Blue North — with interests in timber, agriculture, boatbuilding and fishing — describes itself as a “sustainable resource company.” But this company does more than talk a good game; it subscribes to cutting-edge technology and high-quality craftsmanship that demonstrate its commitment to the environment. The proof is in its latest fishing boat design, a remarkable 191-footer being built for Blue North’s Alaskan cod hook-and-line business. 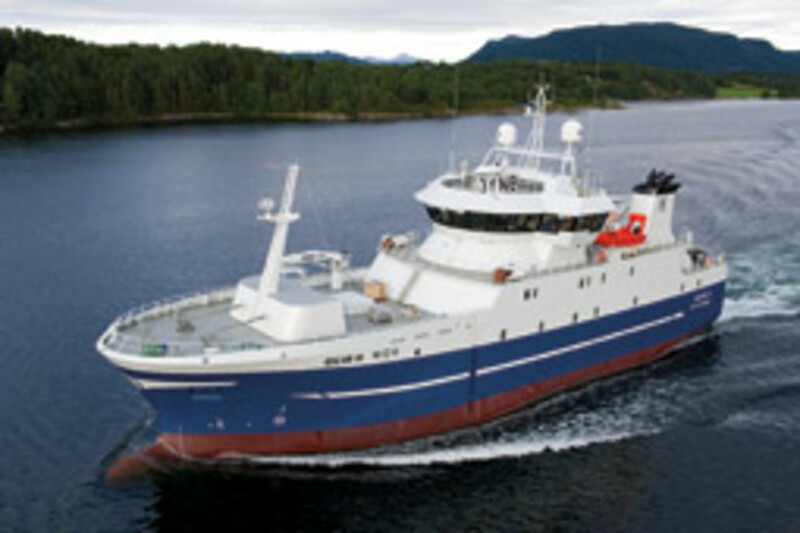 Why am I writing about a 191-foot commercial fishing vessel? It’s pretty simple. 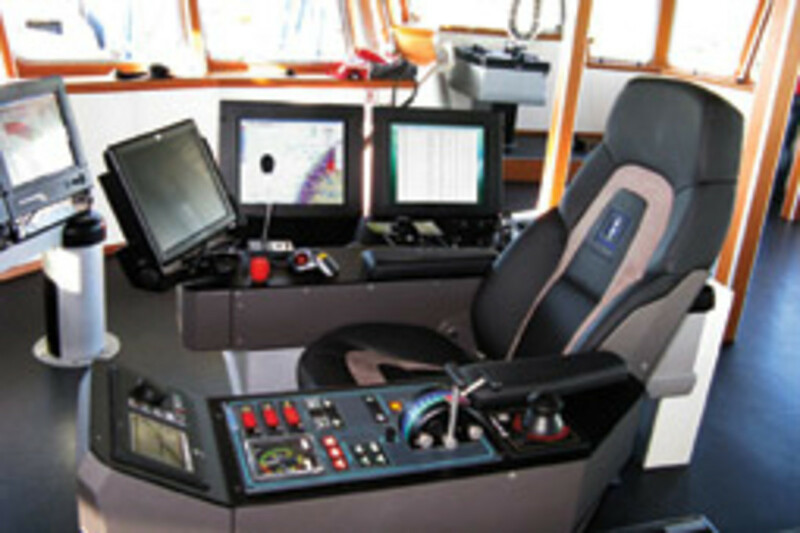 Seaworthiness, vessel motion, topside safety and other design elements apply equally to any craft — big or small, commercial or recreational. The Blue North ST-155, as the new build is known, stands out in so many ways for its intelligent design, and much of the same thinking can be applied to your next boat. First some background. Blue North is owned by entrepreneurial brothers Patrick and Michael Burns, who migrated from Syracuse, N.Y., to Alaska in the 1970s and started buying old fishing boats, fixing them up and gradually building what is today a fleet of five modern hook-and-line fishing catcher/processor vessels, a small catcher vessel and a Blue North built salmon and sardine seiner launched in 2012. Note the Burns’ emphasis on hook fishing rather than trawling for cod: Cod caught by hook, whether jigging or by longline, are of better food quality than those caught in nets. They are brought up with little trauma to the fish (at least from our perspective) and —of increasing importance environmentally — with minimal damage to the sea floor. People are willing to pay a premium for higher quality fish, so fishing this way is a sound business decision. On this new ship, boneless cod fillets and cod loins will be processed, vacuum-packed and flash-frozen within a few minutes of being caught. Most hook-and-line fleets that process the catch on board use only the dressed fish, or 50 percent of its entire weight. The rest of the fish is ground up and discharged overboard due to a lack of space, refrigeration capacity or on-board labor. On the ST-155, the whole fish is processed, with practically nothing wasted. 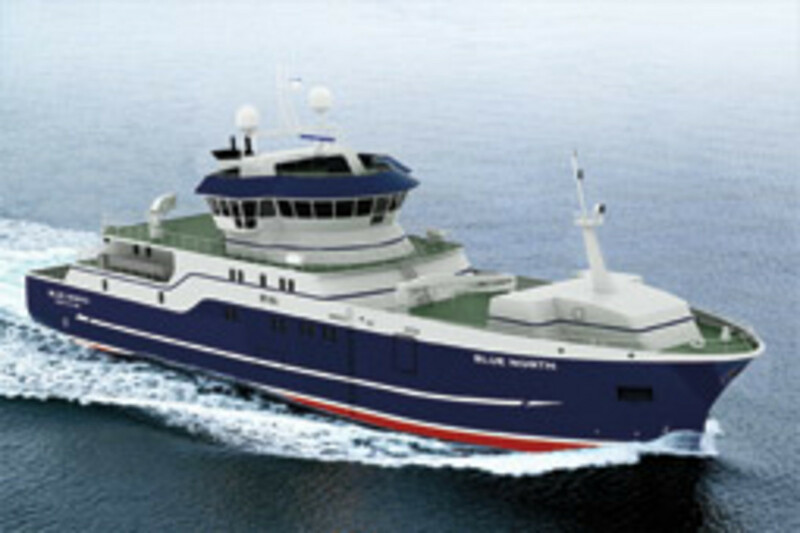 This is revolutionary: The new Blue North vessel is not focused on catching more fish; instead, its on-board processing facility will utilize more of the fish that are caught. The liver, stomach, roe, milt and head will be retained. 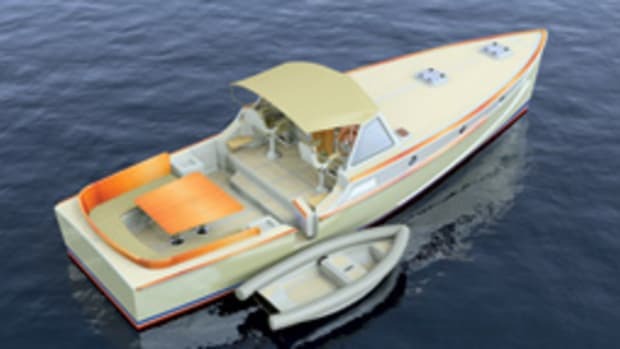 The ST-155 was designed by the Norwegian firm Skipsteknisk and is being built by Dakota Creek Industries in Anacortes, Wash. With a late 2014 launch date set, this ship radiates intelligent design and should serve as a spur to innovation in the powerboat and motoryacht industry. From the outside it looks more like a heavy-weather transoceanic yacht than a fishing boat. In fact, with no visible rigging whatsoever, it doesn’t look like a fishing boat at all. On ST-155, the longline is hauled from inside, through a “moon pool” – essentially a compartment with an opening in the bottom of the hull — where it’s dry, warm and far safer than working topside in nasty weather. 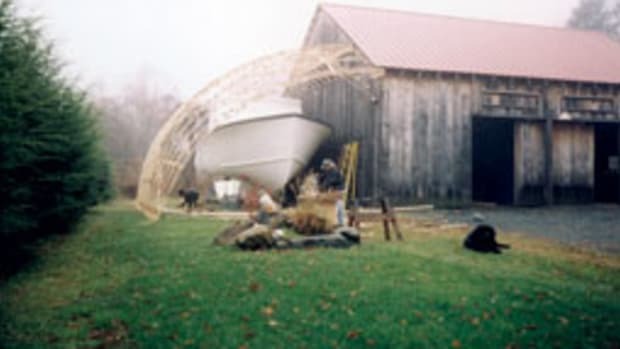 Its location and cocooned fishing environs also allow the boat to continue working in worse weather than a conventional trawler could safely handle. There is no longer any real risk of falling overboard — one of the most hazardous risks in a dangerous occupation — which should free workers to concentrate on returning unwanted species to the ocean. The ship’s contemporary lines are attractive, and it looks like it could handle some of the worst sea conditions likely to be encountered. 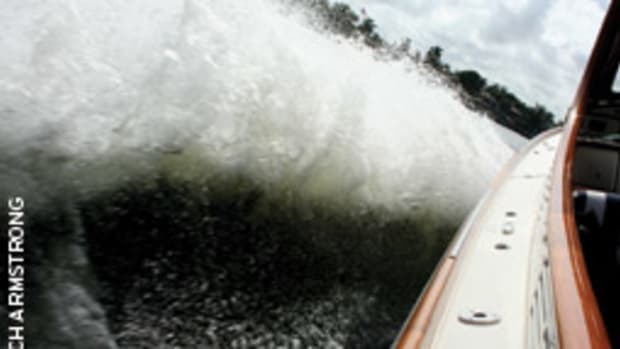 Let’s look at some of the features that have direct or indirect applicability to recreational boats. The hull uses formed steel plates to minimize resistance. Forming the steel plates is analogous to the transformation of a car’s thin, flat steel plates into compound curves with the use of presses and dies that stretch the steel into the desired shape. Shaping the hull plates to minimize resistance provides a big improvement over a hull form designed around the limitations of steel “planks” that are bent and twisted into shape without actually deforming the steel. Improving the hull form contributes to fuel savings of as much as 30 percent when combined with an efficient propulsion system. This in turn increases profitability while expanding the available time on station for a given fuel load. Building the dies necessary to form the steel plating is an expensive undertaking, arguing for series production, so it will be interesting to see how the different yards that have built this design are handling that challenge. I’m sure we agree that staying upright and floating is fundamental to the success of any vessel. So it’s good to see that freeboard is very high from bow to stern. Lots of freeboard, or hull height, is great at keeping the ocean out of a boat. There are also no low working decks aft for the seas to board and destabilize the vessel through free-surface effect. It is very difficult to imagine sea conditions in which this ship would be vulnerable to boarding seas, or at least to water on deck that would remain on board long enough to be a real threat to stability. The one spot in which this ship at first glance may be vulnerable is her sail area. All that freeboard helps keep the waves at bay, but it also makes the boat blow around a lot more, especially in a beam wind. She will heel more than a lower-profile vessel as a result, but that’s where her weight stability comes into play. If VCG (vertical center of gravity) is low and GM (metacentric height) is ample, she will do fine. Fortunately, our intrepid Norwegian designers take stability seriously, incorporating a heavily ballasted box keel design to keep the center of gravity low. Making the ship even more seakindly — and seaworthy — is an anti-rolling tank. This works by using a full-beam water tank with baffles that control the flow of water from one side to the other as the ship rolls. Water flows from side to side, out of synch with the ship’s roll period, countering the momentum and energy. On the Skipsteknisk website (www.skipsteknisk.no), we see that ST-155 has a draft of 17.6 feet. This deep draft tells us that this is an oceangoing vessel capable of operating in virtually any weather. Simply put, the more hull under water, the greater the ship’s displacement and the more able it is to maintain control in heavy weather. Such a draft also speaks to the sheer mass — 900 tons in this case — at hand to counter the effects of wind and wave. This much draft balances out all that sail area as a function of above/below water area, so the vessel will be less susceptible to the vagaries of high winds and large seas. The deep draft indicates a low VCG and creates a lot of righting energy through a wide range of positive stability, another key measure of survivability. 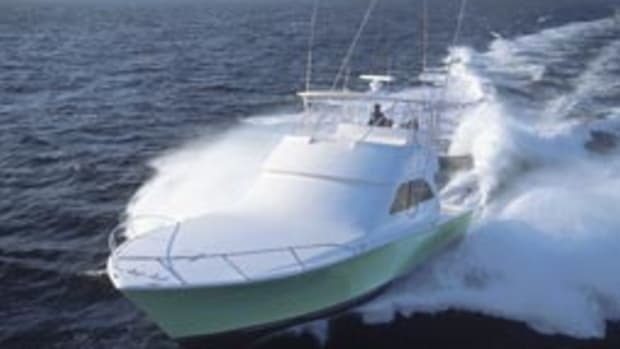 If this were a yacht with 7 or 8 feet of draft, there would simply not be enough hull depth for a low CG, and the vessel would be much less seaworthy and limited to far more moderate sea conditions. The ship is aerodynamically and hydrodynamically streamlined. Consider how little resistance to the wind is offered by the sloping deckhouse and circular pilothouse. Driving this ship at 14 knots into a 40-knot headwind will require less power to overcome wind resistance than with non-aerodynamic designs. The slippery superstructure not only reduces fuel consumption in a head wind, but it also makes the ship easier to maneuver in a seaway in extreme conditions. If you can’t put the bow into the wind and keep it there in extreme conditions, then chances of survival, let alone being able to fish, are diminished. Every bit of streamlining above the waterline helps. 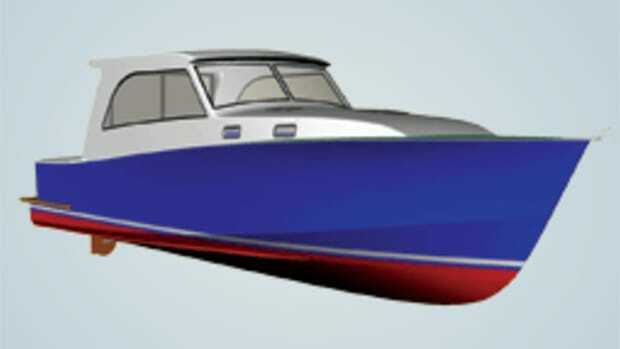 So we have high freeboard, a hydrodynamic hull for improved efficiency, aerodynamic topsides for less resistance and better control in high winds, and deep draft and a ballasted box-keel for lessened susceptibility to the wind and greater ultimate stability. All of these elements, in addition to the anti-roll tank that further improves stability (and crew comfort) make it highly unlikely that the ship will capsize and sink in extreme conditions. Let’s take a look at the ship’s propulsion system and how it contributes to seaworthiness. The ST-155 has an 1,800 kW (2,412 hp) diesel-electric, twin-azimuth propulsion system. This means the ship has a diesel engine driving a generator that in turn powers an electric motor driving twin pods with fixed counter-rotating propellers that direct thrust in the desired direction. This combination has a number of advantages that produce greater efficiency, improved maneuverability and longer diesel engine life. You can also separate the diesel generator and the motor by any distance you want, using cables to supply electricity to the motor. This opens up space allocation in the engine room to suit the ship’s needs and allows weight to be redistributed optimally without impacting propulsion efficiency. Also, with a diesel-electric drive, the diesel engine rpm can be matched to the power demand of the propulsor (the pod propellers), with the motor pulling more power out of the diesel engine at lower throttle settings. In a conventional drivetrain with the diesel driving a shaft and fixed propeller through a reduction gear, the propeller load is a function of shaft rpm, and the engine is underloaded until it is running at cruise rpm, close to full power. A fixed propeller doesn’t absorb nearly as much horsepower at intermediate throttle settings as the engine is capable of delivering. However, with the propellers in the pod system and the electric motor directly driving the shafts, the optimum combination of diesel rpm, electric motor output, and propeller speed and direction can be selected automatically by the propulsion control system for optimum efficiency. It’s also better for the diesel’s longevity and efficiency to be loaded up at intermediate rpm settings. The azimuthing pods make the ship more maneuverable since they can be turned independently, vectoring full prop thrust in any direction, rather than just partially deflecting it with a rudder. In addition to the main propulsion system, there are three generators — two 910 eKW and one 500 eKW. There is also an emergency generator that can serve to provide hotel services in port, including heat, air conditioning, lighting, air compressors and so on. With its new low-emission diesels, this ship will be the first to comply with the EPA’s Tier III emission standards. Of course, one of the advantages of hook fishing is you don’t need to haul a big net through the water. That takes tremendous power, along with a larger engine that weighs more and takes up more space inside the hull, as do the larger fuel tanks needed to supply these demands. So with the diesel-electric propulsion system and two propulsion units, this ship will be very unlikely to lose propulsion power. This redundancy and reliability, in turn, make the ship that much more seaworthy. Impossible as it seems, if all else failed and the ship were to go down — the prudent mariner always has this possibility in the back of his mind — there are backups to the backups. And this vessel has a man-overboard boat and two 30-man life rafts for its 26-man crew, along with other survival gear. The pilothouse is right in the middle of the hull, and that will make for a happy bridge crew. This is right where pitching motions are minimized, making her seakindly for her crew topside. The bridge offers excellent 360-degree visibility through large windows with narrow mullions. The windows are also outboard-slanting, which helps to eliminate glare while minimizing distortion in the direction you’d want to look out from the bridge — out and slightly downward. I see tall railings everywhere on deck, at least the 1 meter (39 inches) height required by classification societies. A meter is a safe height because it is above your body’s center of gravity, so when you go sliding across the deck during a 30-degree roll (35 or more degrees without the anti-roll tanks), unless you become airborne, you’ll be fine when you slam into the rail. Perhaps you’ll break some bones, but you’ll still be on board, so you can have them set when the spray settles. If the moon pool is in the center of the hull longitudinally, like the bridge, this area will be even more comfortable. 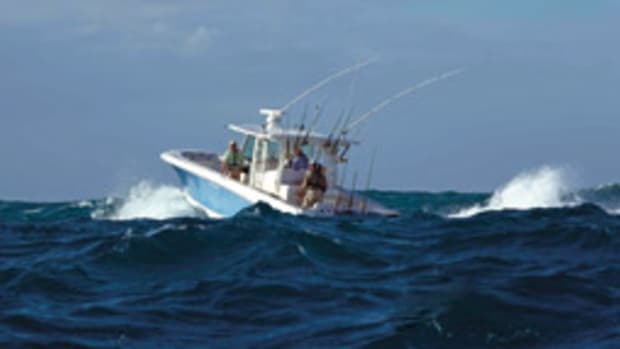 That’s because the crew doing the fishing will be very close to sea level, where rotational rolling and pitching accelerations are minimized, right near the vessel’s roll axis. The only motions that will be identically felt from the top of the mast to the keel is heaving, the vessel’s vertical up-and-down motion. Working inside the ship close to the neutral roll-and-pitch axis is as good as it gets. To make the working environment any more comfortable they would either need to get a bigger ship or stay at the dock. Inside, the ST-155 is well insulated, making it more comfortable for the crew and requiring less energy to heat, reducing fuel consumption. The interior is heated by engine waste heat supplied from a high-tech recovery system. This heat also is used to provide hot water for the crew and for cleaning the vessel or defrosting in the cargo hold and frozen areas. The ship has a hospital (remember all those hooks), lounges, a mess deck and a laundry. Most surprising, accustomed as I was in my youth to sharing a room with 30 other Coasties stacked three high, is that many of the staterooms have single berths; the remainder are two berth, and every stateroom has its own head with a sink and shower. Blue North treats crewmembers better than the Navy treats its officers. So what is the takeaway for the intelligent boater? The ocean will incessantly look for a way to capsize or sink your boat, so it should be designed to thwart that possibility at every turn. Seaworthiness comes from more than just the design of the hull — it also considers weight distribution, the range of stability, reducing roll passively and the deck’s ability to shed water quickly. It depends on having enough power to maneuver in all conditions and to keep the bow into the seas at slow speed. 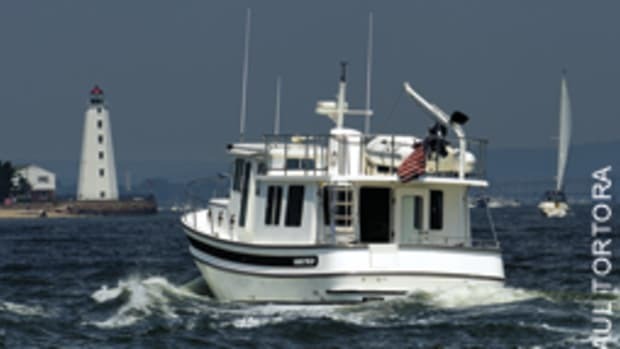 Propulsion reliability and redundancy are essentially to a well-found boat. Minimizing drag from water and air reduces power and fuel requirements. 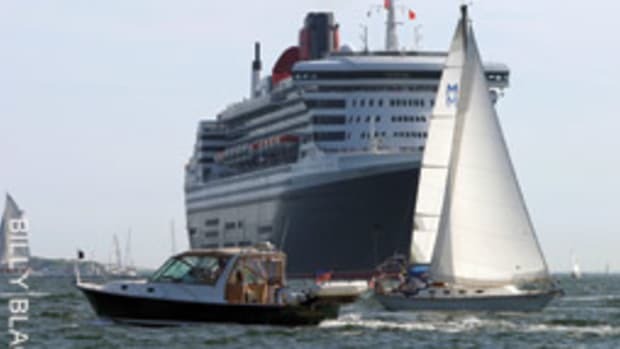 Despite clever marketing copy, shallow draft and a high superstructure make a boat comparatively hard to control and easier to capsize. Situational awareness on the bridge is essential, since you can’t avoid what you can’t see, whether a freak sea or a tanker 5,000 yards away on a constant bearing with decreasing range. Where the bridge and passenger quarters (and the working stations in this case) are situated is critical to comfort and avoiding fatigue. The ends of a vessel should be avoided; the center of the boat and its lowest points are the most comfortable locations. Crew comfort is important not just for ship morale but also for the resulting alertness and, therefore, the safer working conditions it creates. The Burns brothers got where they are by taking risks, but they don’t want their crews taking any more than necessary.